Josef Hoffmann was a brilliant Austrian architect. Although born in Morovia (now part of the Czech Republic), he studied architecture at the University of Vienna. He became one of the most iconic figures in architecture in the 20th Century. Following a journey in Itay, he refined his style and made it more concise and geometric, showing a real eye for detail. His use of cubed shapes made him one of the founders of the Vienna Secession. A geometric cube or cubes can be found in almost all of Hoffman's creations. Among Hoffmann's design's is the Kubus Armchair from 1910. It is essential as both decoration and furniture. Stood on a solid wooden structure, it has a soft foam cushion concealed in smooth, high-quality leather. Its singular design is a result of the recurrent use of geometric squares and cubes. This style was highly valued by Josef Hoffman and was very popular at the time, earning him the nickname of Quadrati-Hoffmann (Square Hoffman). He developed a rational form without curves that was precise to the millimetre. 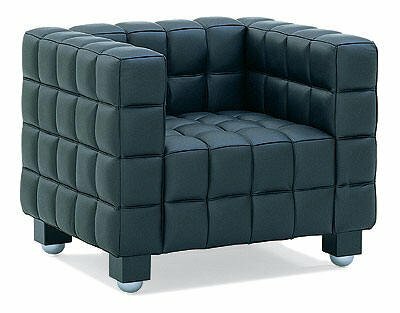 The Kubus Armchair is an exceptional creation. Although it looks simple, it is actually the result of meticulous attention to detail. Naturally conscientious, Josef Hoffmann developed a modern and sophisticated style.